Yes! Another Indie Spotlight, I've got lots of them coming up for you in the near future, Indie mania has struck here on Polish Fixation! Today's spotlight is on Feenix Polish! "Feenix Polish offers handmade nail polish, blended in small batches and shipped with care. Glitters, shimmers, sheers, jellies and topcoats are among our offerings. We constantly try new blends and update the items in our shop on a regular basis. 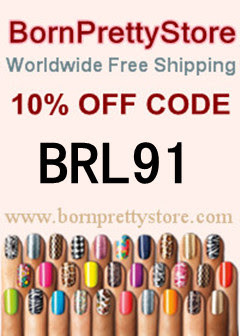 We take pride in offering beautiful, high quality nail polish with quick shipping and strong customer support. All of our polishes are "3-Free," and each bottle contains stainless steel mixing balls." Clots of Love is a new color and is "black jelly that's just loaded with fine and ultrafine red glitter". I was able to use two coats of polish on its own for the pictured look. If you layer it over black you might be able to use just one coat. You definitely need a nice thick topcoat with this one cause it's very "hungry". 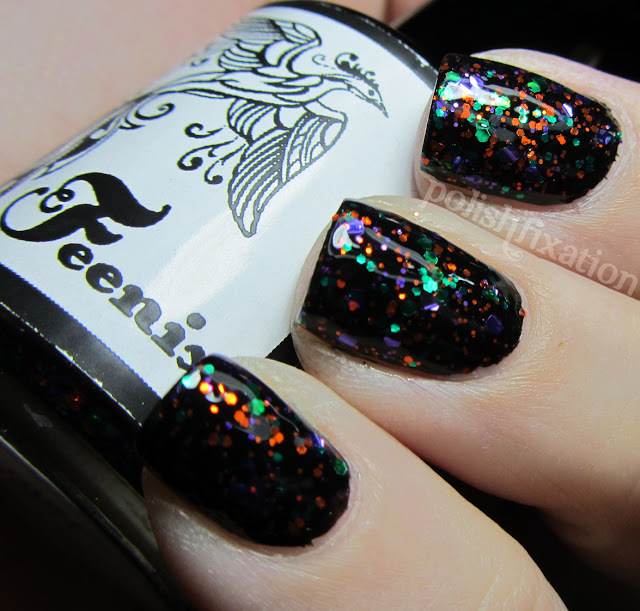 I think this is a gorgeous glitter, love it! This is a "blue jelly filled with a mixture of both small and large blue glitters in assorted shapes". Can I just say GORGEOUS! This is just two coats of polish on its own. It is SO amazingly sparkly and blue, I just love it. I didn't want to take it off! Another new polish for the fall Halloween season, Halloween Party is a "black jelly base, shot full of two sizes of glitters in orange, purple and green". I layered this one over black because the black in the jelly base was just a little too sheer for me to want to wear it on its own. I love this look! It's so pretty and really does feel just like Halloween! Halloween Party with Matte Top coat. Ummm....LOVE! I think I like it even more matte than shiny! I think it really makes the colors POP! But whichever way you decide to wear this color, it's gorgeous! Overall I was really impressed with these Feenix Polishes! I definitely am excited to see what else they have in store in the future. 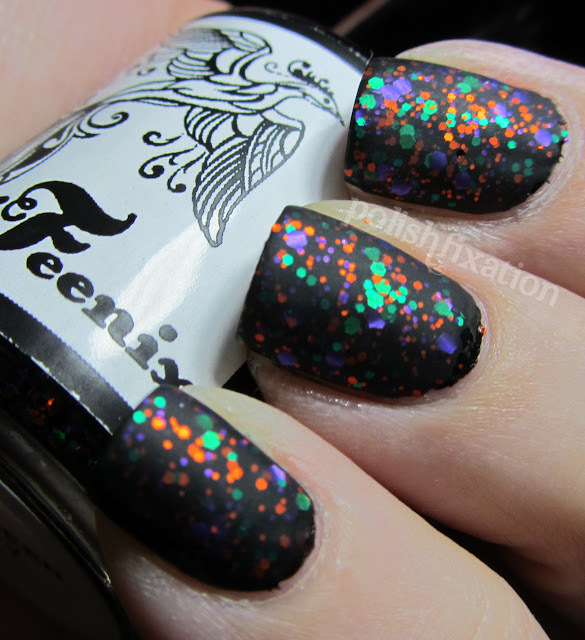 Feenix Polish are available HERE, for $8.00 per full size bottle. You can also stay up to date with Feenix Polish by following them on facebook! Which one of these is your favorite? Have you tried any Feenix Polishes already? Clots of love is goooorgeous.